State Rep. Molly White, R-Belton, is not the first Texas lawmaker to make comments offensive to the Muslim community. There was considerable outrage when state Rep. Molly White, R-Belton, left instructions with her staff to ask visitors to her office on Texas Muslim Capitol Day to "renounce Islamic terrorist groups and publicly announce allegiance to America and our laws." But it was not the first time a Texas elected official has made waves for comments about Muslims and Islam in America. "We've had a few people who are — for lack of a better term — haters," said Mustafaa Carroll, executive director of the Houston chapter of the Council on American-Islamic Relations, or CAIR. "I don't want this to sound like the Capitol is against Muslims — they're not. But there's a few people that are, and they make it known in no uncertain terms." White and elected officials who have made statements similar to hers about Muslims have defended their comments, saying they are far from hateful. They say they believe in religious freedom but are entitled to free speech. And they have spoken freely. Riddle, who did not return a call seeking comment for this story, later said she stood behind her statement. At an event earlier this month, Agriculture Commissioner Sid Miller said he was kept up at night with "long-range concerns as I hold those two grandbabies on my lap. I have to wonder, when they have grandbabies to hold in their lap, will we be a socialist country? Will we be a Muslim country? Are we doing enough?" Miller could not be reached for comment on Friday. And in 2007, during his first term as a Texas state senator, Dan Patrick boycotted the chamber's first Muslim prayer, later saying, "I think that it's important that we are tolerant as a people of all faiths, but that doesn't mean we have to endorse all faiths, and that was my decision." Patrick, who is now the lieutenant governor, walked out of another Muslim prayer in 2012. Patrick could not be reached for comment on Friday. The State Board of Education has also come under fire for the way it has discussed Islamic culture. After four hours of debate in 2010, the board passed a resolution alleging "pro-Islamic/anti-Christian" bias in Texas textbooks. The author of the resolution wrote that the textbooks devoted "120 student text lines to Christian beliefs, practices, and holy writings but 248 (more than twice as many) to those of Islam." Then-board member Rick Agosto, D-San Antonio, said the resolution "makes us look cuckoo." Carroll said that among those examples, White's Facebook post was "one of the most disturbing things" he's seen. 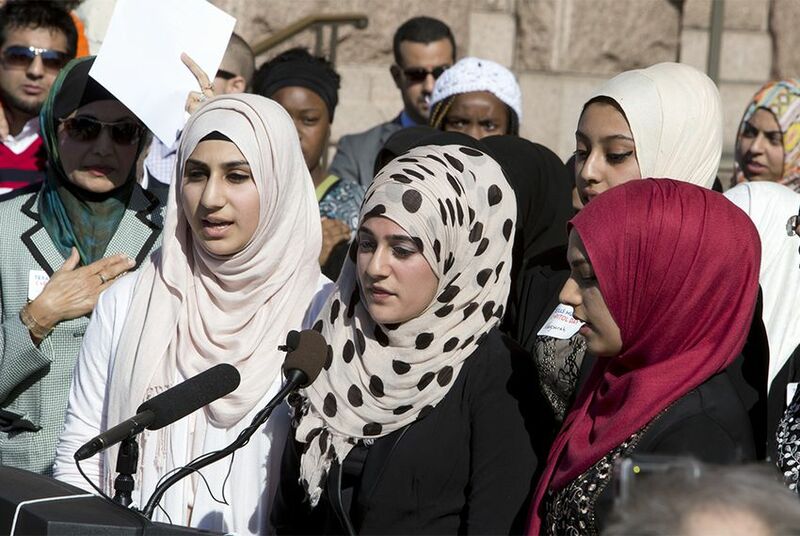 Texas has the eighth-largest Muslim population in the United States, with more than 420,000 Muslims residing in the state, according to estimates from the Texas State Historical Association. On Thursday, House Speaker Joe Straus, R-San Antonio, took direct aim at the Facebook post, saying that such legislative behavior "reflects poorly on the entire body and distracts from the very important work in front of us." Bee Moorhead, executive director of Texas Impact, a grassroots network representing multiple religious faiths, said Muslim leaders eventually met with White’s staff on Thursday and had a "pleasant conversation." And she said Thursday's disruptions — from the Facebook post to a protest at the Capitol — were not par for the course for religious groups, which routinely participate in the legislative process. “Hopefully Jews and Catholics and Lutherans and Baptists and everybody else can see what happened yesterday and think [legislative participation] is more important than I thought,’” Moorhead said. “Hopefully it makes better citizens out of all the faith communities in Texas." Correction: Mustafaa Carroll of the Council on American-Islamic Relations was originally misidentified. He is Mustafaa, not Mustafa, and he is the executive director of the group's branch in Houston, not Dallas-Fort Worth.